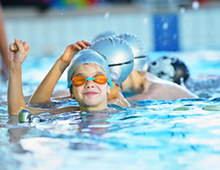 Swim Stars provide excellent group swimming lessons for children from 4 years and older. Classes are small to ensure individual attention. Children learn important life saving skills, swimming technique and water confidence in a fun, relaxed environment. Here at Swim Stars, we provide exceptional swimming instructors with plenty of experience in teaching children of all levels, ages and abilities. Our teachers are all fully qualified with a passion for swimming. 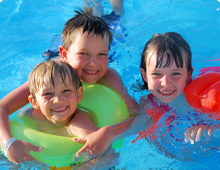 Swimming lessons are an essential part of every child’s education. It's not just a sport. Here at Swim Stars, we are passionate about educating parents about the importance of swimming at an early age. It's a skill your children will never forgot when they are older and will surely thank you for! We don't just teach babies! We also provide private adult swimming lessons. If you are a nervous beginner, looking to improve your technique, increase your fitness or keep up with your own children, let us know! Our patient instructors will help you achieve your goal.